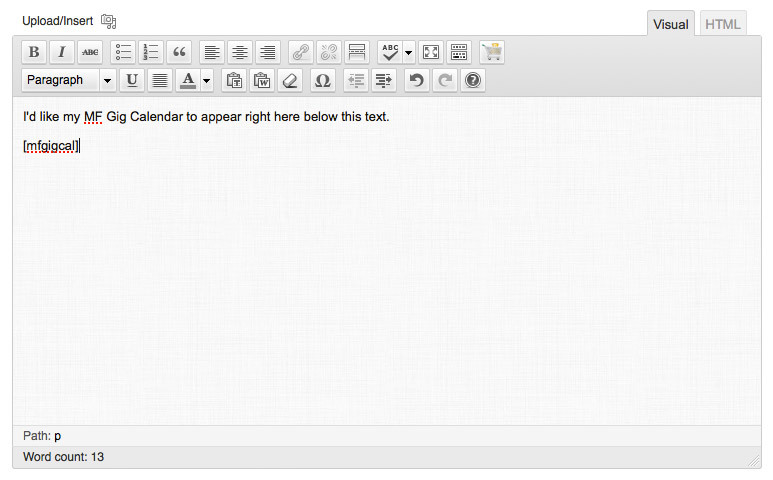 I developed this event calendar plugin because I wanted a performance calendar to use right here on my own website. In the process I tried to create something that was flexible and easy to use and would work for more than just musicians. …but as a general rule I’ve tried to keep this as simple as possible. I hope anyone who needs to display a list of events on their WordPress site would find this a useful option. Easy as pie! You just install it as you would any other WordPress plugin. This creates a new table in your WordPress database to store the events, and you’ll see the “Event Calendar” menu item in WordPress admin area. 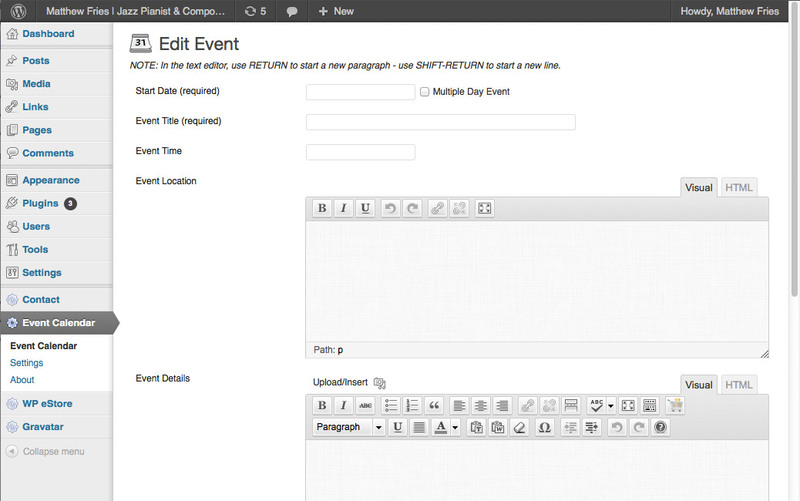 Once it’s installed you can easily add, edit or delete events through the plugin’s Event Calendar editor page. To display the event in any Page or Post on your site you just include the MF Gig Calendar shortcode in the spot where you want the calendar to appear. There are some optional variables you can add to this shortcode to display specific events, specific dates, or even a range of dates. Feature an event, create your own monthly or annual archives, feature a tour… Be creative. I’ve also included a widget that you can use to display a few upcoming events in your sidebar. You can control the number of events to display and the displayed widget title, and you can have the widget link to a page on your site that contains the complete event calendar.